The Skipper celebrates his 4? th birthday today, Monday 28 June 2010. Can you guess what the number is? It’s like counting jelly beans in a jar. Happy Birthday from the team ! At the crack of dawn we upped our anchor and went for a last minute dive at Mariners Cave. This cave is underwater and can be very difficult to find. You have to find a rock ledge with a solo pandanus tree which hangs over the rockface, then if you’re in the right place you will see a very dark black shape under the water. You dive into the water, dive under a huge rock ledge and then you pop up on the other side into a aqua blue pool which has a huge air pocket and spectacular fish life. We took Vinnie there and before she dived down into the deep dark blue, all I heard her say was “are you sure this is ok?” and then they were gone. Once this was completed we headed out to a place called Nuiatoputapu. This was a 170 NM trip, with overnight travel and morning arrival. This had to be done so as to arrive during daylight to navigate around and through the reefs and the channel entrance. Hi everyone. We had a new crew member join us last night. Vinnie Duncan, we’ve been waiting in eager anticipation for her arrival. As a bonus we also got some long awaited goodies namely chocolate! Vinnie is reliving a sailing experience and doing the leg from Neiafu Tonga and Nuiatoputapu Tonga finishing at Savu Savu Fiji. We are leaving Neiafu Tonga at some stage during the day. This is our last day of civilization until we arrive in Savusavu Fiji. Today we cleared customs, immigration and loaded up with duty free diesel. This was an all day experience!!! We restocked what supplies we could load up with and we finally got underway. We stopped at a place called Swallows cave and had a quick dive before the sun went down and took advantage of some photo opportunities. We met the rest of the rally at a bay call Port Maurelle. 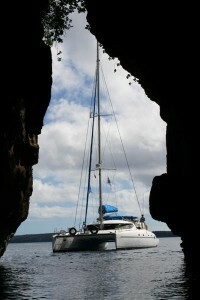 We have been sailing around the various islands in the Vava’u group for the last couple of days. One of the highlights has been Swallows Cave, this is a cave set deep within a rock face. The visibility is so clear you can see right to its sand and rocky bottom. 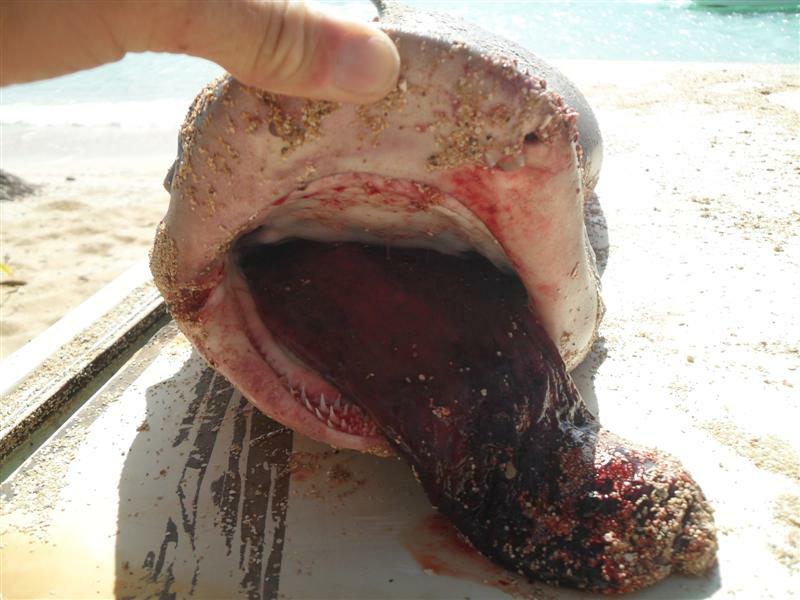 The fish life was alive like you could never imagine. The sun shines through and gives you this awesome aqua blue colour in the water. We have to travel carefully around the various bays, unlike Auckland harbor the Vava’u group has many treacherous reefs, these are not chartered clearly, so we use “the moorings guide and a cruising guide “Sailing Birds Guide” to work our way around. It can be quite eerie at times, but learn to look out for the breaking water, different colours in the water to navigate safely around. Once you get to your destination, it’s certainly worth it. We finally anchored in a lovely bay called Nuku. 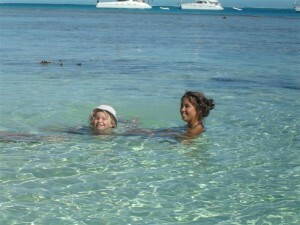 The snorkeling is really great for beginners, the lagoon around it is a brilliant blue. A very small island type atoll in the middle of a group of large islands. The next day we navigated a very tricky passage to a place called Kanutu. 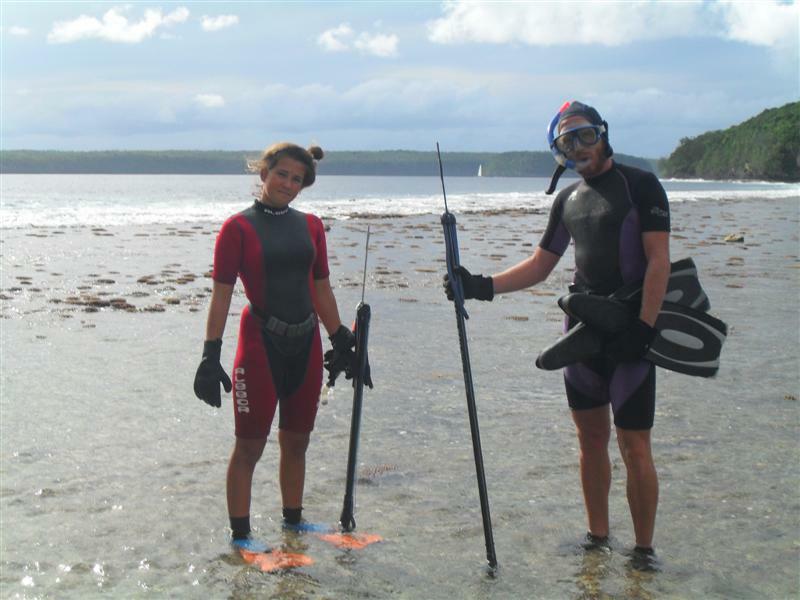 Gavin and Diede went for a snorkel outside the reef. Diede speared a snapper. He is becoming quite a hand at it. We had a bonfire on the beach along with other boaties from our rally. We moved the next day to another island called Avalau. Another idyllic paradise covered in white sand and crystal blue waters surrounding it. Seeing all these islands just becomes the norm after a while. They really are out of this world. Avalau was a hoot, as it is uninhabited, it has goats running around it. The local fishermen stop here overnight, sleep on the beach, kill a goat, eat it and leave the remains laying on the beach. A very different way of life to you or I.
Tonight we have come back into Neiafu as Gavin, Diede and Shae are assisting on a yacht race in the harbour. It is very hot and warm here with very little wind. That’s all for now. Hope everyone is all good and well. Well we are now in the Vava’u group. We are in a place called Neiafu. We have had great sailing weather. The crossing took us 5 hours. We actually have civilization here, internet, cafes and the like. There are even cars and bitumen roads and footpaths. You still see pigs and chooks running the main streets though. We have to swing off a mooring. Unfortunately it is too deep for any yacht to drop their picks here. So Neiafu supply all boaties with moorings to tie up to for a small fee of 12.50 Pa’anga per night, which is the local currency. There are heaps of jelly fish here as well as these fish, called mora which look like someone has stood on their heads, they have a footprint like indentation on the top of them as well as a small pink sucker like thing which they normally attach themselves to things like whales. So no swimming here! We had a bit of a hic-up with our generator (this makes our water), it decided not to go. We were fortunate to have someone else’s crew fly up and hand deliver the new part to us within 48 hours much to our relief. We had to tie alongside another cat to fill up with water to get us by. After pulling out the original piece and comparing it to the new part, we decided to put the old piece back and try again. And would you believe it the damn thing worked. It looks like the humidity really gets into some electrical units and causes unnecessary grief, our friends from Noosa also had an issue with their chat plotter, they decided before ordering a new part to take it out and put it back again and it worked. So work that one out. 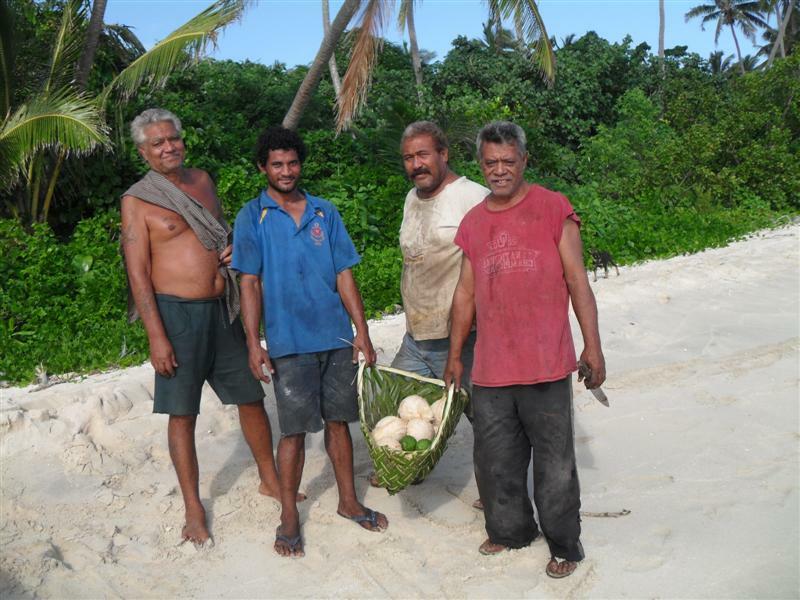 We are currently in a remote island in the Ha’apai Group in Tonga called Uonukuhahake. It is like paradise here, lush green tropical fauna, with stretches of white/gold sand beaches and crystal clear waters. 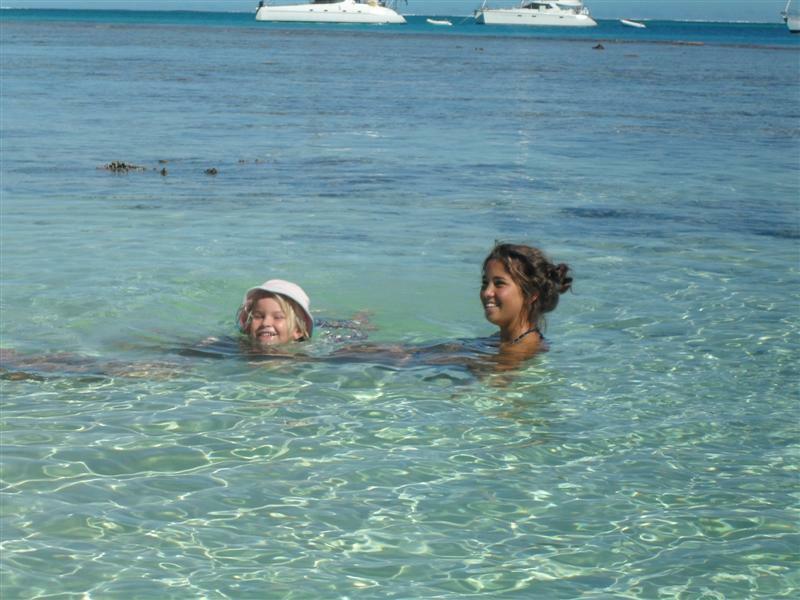 It is very hot here so we spend a lot of the time swimming and snorkeling. It is gorgeous. This is almost like two islands with a huge sand bar right in the middle of it. This is an uninhabited island and the only thing on it is cows of all things. There is no water on this island at all so unsure of how the cows survive. It is covered in lush tropical greenery so we thing that when it rains they get their water from the leaves. We have spent a wonderful time here. We have had two successful bonfires on the beach, with fresh fish (parrot fish, snapper and tuna), potatoes, breadfruit wrapped in tin foil on coals and have shared this with eight boats from the rally. With the sun going down it makes a beautiful sight. We have spent a wonderful 3 nights here and now it’s time to move on. We set sail to another island called Tatafa. We stopped here for lunch then moved on to a place called Uoleva. This has a very long sprawling white beach, backpackers of sorts, and a Tongan style resort. Pigs running around like a free-for-all. We decided to beach Sol Maria here, as we were hoping to put on our new props. 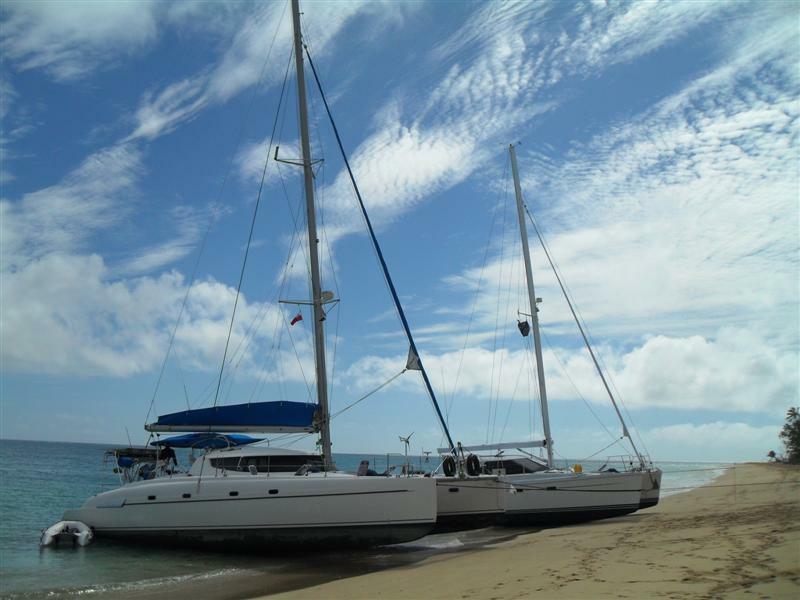 Another catamaran that we have been travelling around with called Catina, also needed to do some major running repairs and also beached their cat. So we had two cats in a cradle on the beach which was a real sight, even for the locals. They thought it was quite amusing to see two boats on a beach. That evening an Umu (Tongan way of cooking in the ground) was prepared for all the cruising boats from the rally. Picture this setting… all the food laid out upon the table, the main course…… mama pig, the sun streaming through the coconut palms, the sea lapping against the silky sand, roosters and chooks running around free range, and baby pigs looking for their mama hmmmmmm. Going vegetarian was definitely an option that night. They have two young children who think that Diede is a human jungle gym and also someone they can practice tying up. A pretty cool family from Noosa, he’s done a number of Sydney Hobarts etc. We spent most of the day hanging out at customs in Pangai so we could clear the Ha’pai group. Unfortunately as we hadn’t cleared Nukulofa we were delayed at Pangai customs. Every group of islands you go in or out of you have to clear customs even though it’s still part of Tonga very bizarre. We left a place called Ha’ano which is one of the last islands of the Ha’apai group and we are now on our way to Va’vau, we are going to a place called Neiafu. We should be at Va’vau by 1400 hrs today. The weather is perfect, seeing the sun come up this morning and nice smooth seas with about a 15kts breeze up our date, what more could you ask for. It’s going to be another scorcher of a day. We’re a bit behind on the updates, so on with the show as the next update will follow.